Brian Michael Bendis has been writing both Superman and Action Comics for a while now. Whilst I’ve personally really been enjoying his work on Action Comics as he focuses on the Daily Planet crew and the mystery with Leviathan. However, when it comes to his Superman I haven’t really been a fan since the beginning. The arc with Rogol Zaar was just alright, and this next one focusing on Superboy hasn’t been great. The positives of this issue are that Bendis isolates Jon and Jor-el and really focuses on the worries between them. 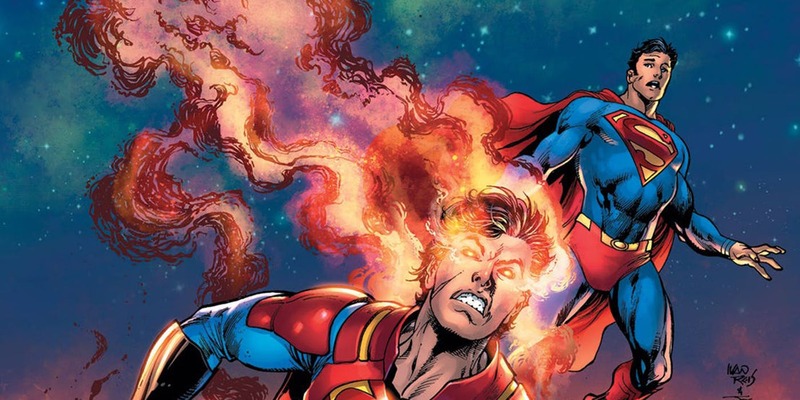 Jor-el is kind of coming to grips because his whole world view has been changed as the science he believed and trusted him, was overthrown by Dr Manhattan. Jon doesn’t know his place in the world, especially when his dad is Superman. The other positive was when Superman goes and punches Mongul as an expression of his rage, which is understandable as a father. Whilst I liked these aspects of the issue, I have to say that I found the issue to be boring. For me a form of entertainment being boring is the worst thing it can be as something that is bad can still be enjoyable. There is beautiful art from Ivan Reis and Brandon Peterson but it feels like a waste as the main story isn’t interesting. The last page reveals that Jon has been transported to earth-3 and meets the crime syndicate. It feels like it is almost with each issue of whatever Bendis writes has a problem continuity wise and ignores things that have come before. The crime syndicate in the new 52 were all killed and it just seems like this has been ignored. This hurts an already poor issue even further and doesn’t make me look forward to the future of the Superman series.